Two-Sentence Summary Leslie uses a public forum over the new town slogan as a chance to practice delegating, a skill she will need if she’s going to take the job she was offered by the National Parks Service. Meanwhile, Andy discovers Duke Silver, and Tom’s search for a good location for his restaurant is nearly sabotaged by April and Donna. Ben: We can just sit back and take it easy. Leslie: No, we’re not going to do that. We’re going to sit forward and take it hard. My Thoughts Parks and Recreation is a show where characters often act in extreme ways for very normal reasons. Behind every outrageous scheme or impassioned outburst is usually a motivation grounded in real, relatable emotions. The comedy on this show often comes from those over-the-top reactions, but the heart comes from the love and friendship that drives those reactions. When that ratio of comedy to heart is off, the show feels off, and that’s been the case more than a few times this season. However, when the ratio is perfect—as it was in “New Slogan”—there’s no better way to spend a half-hour of your week than in Pawnee. Because when your you’re here, than then your you’re home. When you think about the heart that drives Parks and Rec, it all comes back to Leslie and Ben. When these two and their supportive, stable, quirky marriage take center stage in an episode, it’s almost a guarantee that I’m going to adore it. There is no healthier, more enviable marriage on television than the one between Leslie and Ben. As characters, Leslie and Ben are perfect compliments, and as actors, Amy Poehler and Adam Scott are as well. “New Slogan” was such a strong episode for Leslie and Ben. There have been times this season when I’ve grown annoyed with Leslie’s ridiculous responses to situations in Pawnee, but this episode reminded me that even her dumbest ideas (like fraternizing with Crazy Ira and The Douche) can be made bearable when she has someone who actually tells her that her ideas aren’t always the best ones. Ben’s logic is the perfect compliment to Leslie’s often-blind enthusiasm, and I like that—even though he is clearly (and wonderfully) turned-on by her strength and ambition—he isn’t afraid to tell her when he thinks she’s gone too far. Ben’s honesty, practicality, and supportive nature were on full display in “New Slogan,” and that was a good thing—because Leslie needed all of those things to help her work through her concerns about the National Parks Service job offer. Of course I found her binders full of questions hilarious (and wonderfully in-character), but I was initially worried about going deeper into this storyline. My concern was its realism. Why would Leslie turn down this job? What could possibly keep her from moving on to a job where she was actually appreciated like we all want her to be appreciated? Didn’t Jen Barkley’s excellent advice to “dream bigger” mean anything? I think this episode did an even better job than last week’s at explaining what could be holding Leslie back. This time, it wasn’t her love for Pawnee holding the reins; it was her own fear of failure. There’s a lot to fear from learning to delegate (as we all saw with Jerry/Larry and those perfectly nerdy grammar jokes). It means losing control, and we know Leslie likes to control any and all situations imaginable. But, as Ben so astutely said, moving up in the world means becoming more of a leader and less of a grunt-worker, and Leslie was born to lead; anyone who’s watched this show can see that. There’s also a lot to fear in leaving your career comfort zone. My favorite part of the episode was when Leslie finally voiced what she’s been afraid of—trying a new job and failing at it. It’s not an unfounded fear; her disastrous run as a city council member would make anyone skittish, and it’s terrifying to think that after years of doing one job you know you can do, you might try to dream bigger but fall on your face. Suddenly, Leslie’s concerns about taking this new job made perfect sense. If any other character on this show was facing Leslie’s decision, she would encourage them to follow their passion, and she would support their ambitions. It’s who she is. And I love that, in Ben, the writers have given Leslie her own Leslie—her own impassioned support system. My favorite moment in “New Slogan” came when Ben told Leslie he loved her, but she was stupid to think she would fail. Ben believes in Leslie the way she believes in everyone else. When she doubts her abilities, she has someone to tell her she will succeed at whatever dream she wants to chase next. Holding Ben’s hand, Leslie has been able to “leap into the great unknown” (in the wise words of Ron Swanson), and I love that his encouragement of her dreams is such a defining part of his character. No matter what path she chooses, Leslie has someone who makes her happy to walk on that path beside her. And if that’s not an inspiring view of what a strong marriage should be, then I don’t know what is. The other storylines in this episode also featured characters overreacting to situations but ultimately doing so because they were driven by very relatable emotions. Donna and April did everything in their powers to keep Tom from choosing a location for his restaurant and someday leaving them behind. Both women seemed to take a page out of the Leslie Knope handbook in this plot. At first, I really didn’t like the idea of the two of them sabotaging their friend’s dream, and I found it to be too reliant on old sitcom tropes. But somewhere around the mention of Schindler’s Lunch (What could they possibly serve there?) and the joint realization that they needed to fix the mess they made, I was sold on this storyline. Just like it’s scary to fail, it’s also scary to watch your friend move on and leave you behind. But Tom has grown so much as a character that it’s impossible to root against his success at this venture, and it was impossible for Donna and April to root against it, too. Tom’s growth feels so organic, and this episode did a great job of juxtaposing it with April’s own character growth. Just as Tom has grown into a person with serious entrepreneurial potential, April has grown into a person who isn’t as afraid as she once was to show people she cares. Both characters have still retained the humor that comes from their basic personality traits, but they’ve been allowed to grow like young adults actually grow. And it was rewarding to see the way these two kinds of character growth intersected in this storyline. Andy and Ron’s plot followed in the same thematic vein as the others in this episode. Andy wanting to even the score for learning about Ron’s secret “Duke Silver” identity produced perhaps the funniest moment of the episode, as Chris Pratt rambled for minutes about Andy’s secrets—from not knowing who Al Gore is (and being too afraid to ask) to not understanding what the other 98% of 2% milk is. Andy may be the silliest member of this cast of characters, but he’s often the one with the purest heart and best intentions. And I will never pass up an opportunity to watch Andy and Ron interact. Like Poehler and Scott, Pratt and Nick Offerman have such different comedic energies that they create a perfect balance. 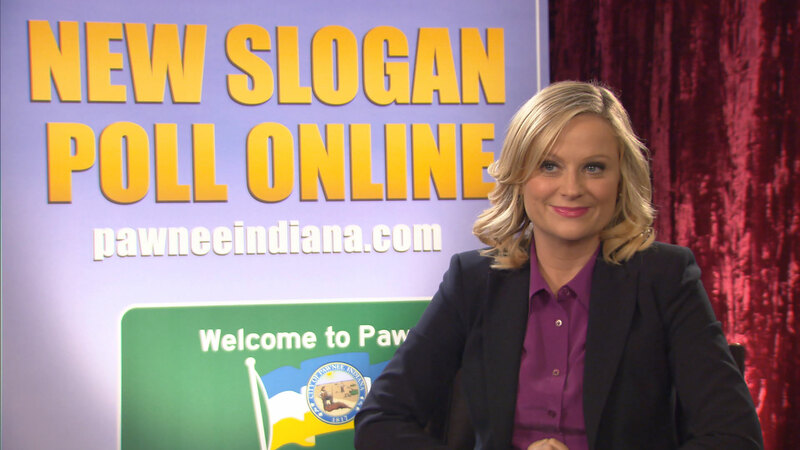 With appearances from a wide range of familiar Pawnee faces, “New Slogan” was a fun reminder of just how entertaining these crazy citizens can be. But it was also a reminder that Parks and Rec isn’t just a show about the relationship between a woman and her town. It’s a show about the relationship between a woman and her husband. And when that marriage takes center stage in an episode, I know I’ll be left feeling nothing but joy (and perhaps a little envy).